Combination unit delivers affordable protection from power failures. The ReliaSource® Auto-Start Lift Station has you covered when the power goes out. 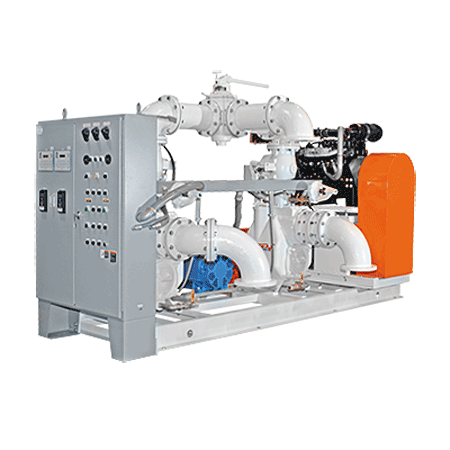 This space-saving unit eliminates the need for an expensive engine/generator set by providing you with a modular combination of pump, electric motor and engine, all coupled to the same drive. When the power fails and the electric motor stops working, liquid levels rise, triggering a control that automatically converts the unit to 12 volt DC. A standby engine drives the pump during the power failure and AC motor operation is automatically restored when the power resumes. The ReliaSource Auto-Start Lift Station meets all standby requirement and uses a variety of fuels to meet your needs. It comes in many standard designs for new installations, and custom designs are available for existing installations. The Gorman-Rupp team of electrical, mechanical and hydraulic engineers work closely throughout the development of each pumping system to ensure that the entire hydro-electrical system works in harmony to meet your system requirements - accurately and reliably. All Gorman-Rupp controls are manufactured of the highest quality components and are available U.L. and C.S.A. listed (not standard).